Eclectic Sun, on beautiful and scenic Lake Jocassee, is Devils Fork State Park’s on-site supplier for all things to do on and around the lake. The “PAVILION” in the day use picnic area of the park is where you will find us. Eclectic Sun is a genuine Surf Shop and Snack-Bar combined. Watersports equipment is available for sale and rent. Eclectic Sun is here to make your day on the water the best it can be. Whether you’re a Pro or just a Beginner our friendly staff is here to assist you with all your Paddle Sports needs. Here is a helpful article we found, please let us know if you have any questions. Paddling refers to the group of watersports that require a paddle to propel and steer a vessel through and across the water. Traditionally, two sports have fallen in the category of paddling, that is canoeing and kayaking. Technically speaking, rafting is also a paddlesport, whether river rafting or whitewater rafting. Also, It truly is amazing that after thousands of years of paddling that a relatively new paddlesport is on the scene. We’re talking about SUP, or standup paddleboarding. While the above utilitarian definition is accurate it doesn’t even scratch the surface of what paddling is to those of us who find our passion floating just inches above the surface of the water. And, while there are many reasons why people paddle one thing is true of all of us. We love to paddle. We live to paddle. Here are descriptions of the sports that make up the category of watersports known as paddling. Generally speaking, canoes are long slender boats that have raised seats in them. The canoeist sits in the canoe with their legs at about a 90-degree angle. Canoes are propelled with a single bladed paddle and can be paddled solo or in tandem. 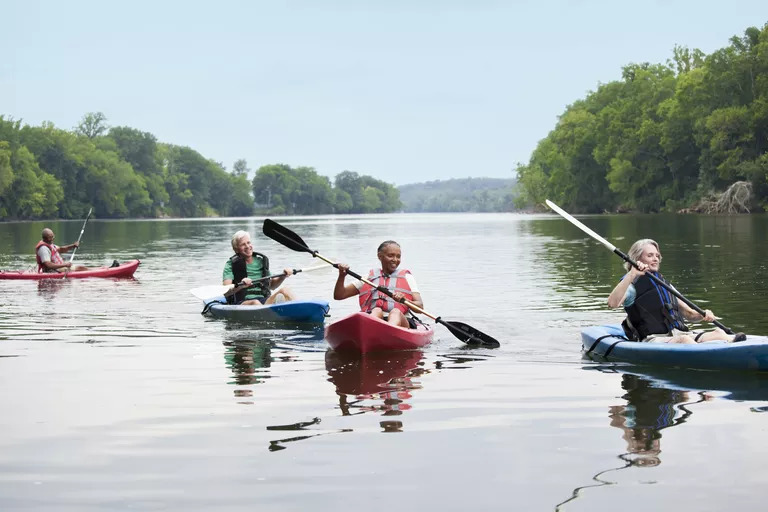 While it is generally thought that canoeing is the most serene paddle sport of the bunch, that is actually a misconception. There are racing canoes and there are whitewater canoes. 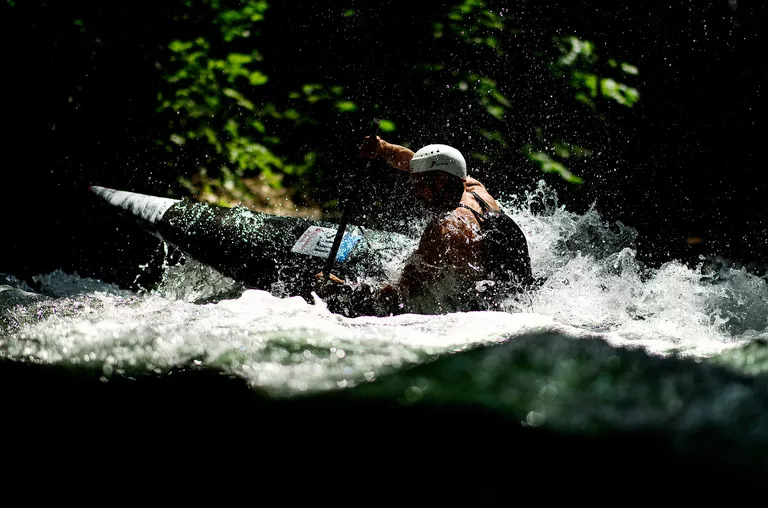 A whitewater canoe can do anything a whitewater kayak can do however it does require a higher degree of skill to do it in a canoe given that a canoeist uses a paddle with only one blade. Canoeing is a paddle sport that is a tried and true favorite among the outdoor community. They are kept on the shores of camps and weekend getaways to use as a form of recreation. Canoes are often combined with camping trips, fishing outings, and even hunting. And, for years canoes were the rental vessel of choice in state and county parks all over this country. While kayaking has as ancient of a past as canoeing, it has increased in prominence over the last 20 years. From about the 1990s, kayaking has been known as the fast-growing watersport. Only recently has this unofficial designation been in question as a new form of paddling has emerged. Like canoes, kayaks are also long and slender. The seats in kayaks, however, are not raised up as they are in canoes. Instead, they are on the floor of the kayak and the legs are out in front. While there are sit-on-top kayaks, most kayaks are sit-in kayaks. This means that the kayaker’s legs actually slide into the kayak. Experienced kayakers use spray skirts that attach them to the kayak and make the inside of the kayak watertight. Among the most popular types of kayaking are sea kayaking, touring kayaking, whitewater kayaking, and recreational or lake kayaking. While standup paddleboarding has its foundations in surfing, as it uses a paddle to propel the board it is technically a paddlesport. 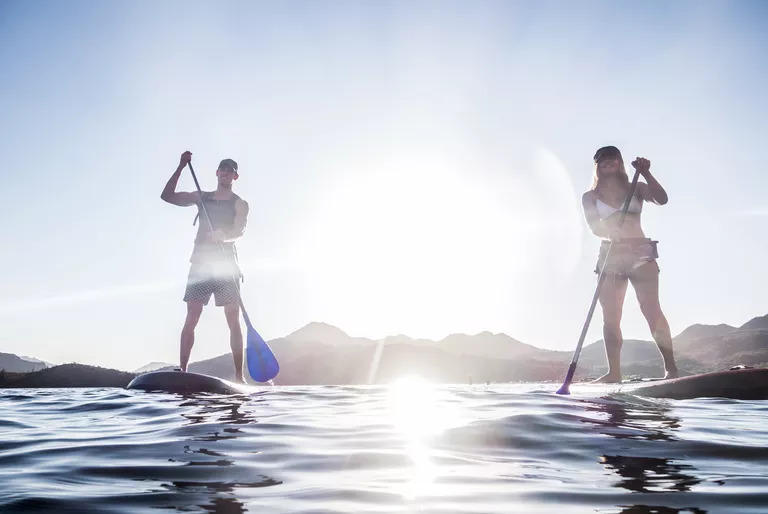 While standup paddleboarding seems like a new sport, there is some evidence that it has been around for quite some time, particularly in Hawaii where it originated. It is safe to say that relatively speaking in the paddling world SUP is a recent phenomenon. There are many types of SUP paddling including surfing, touring, racing, fitness paddling, and SUP Yoga. Believe it or not, there is even whitewater standup paddleboarding. SUP is the latest craze in watersports and has unofficially overtaken kayaking as the fastest growing water sport out there.